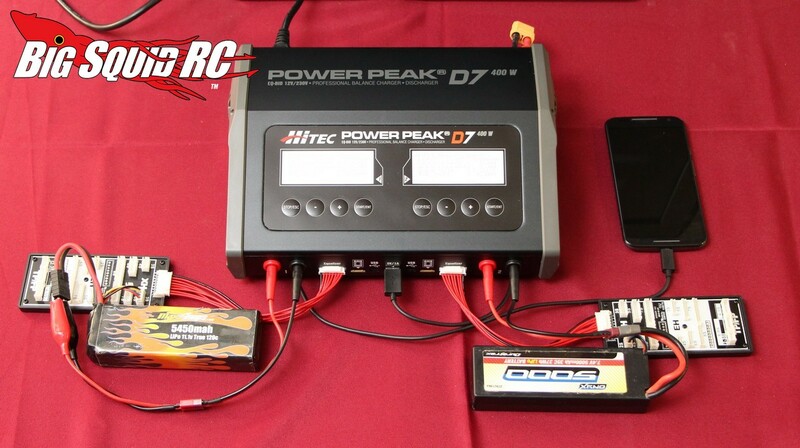 Hitec Power Peak D7 Charger Review « Big Squid RC – RC Car and Truck News, Reviews, Videos, and More! 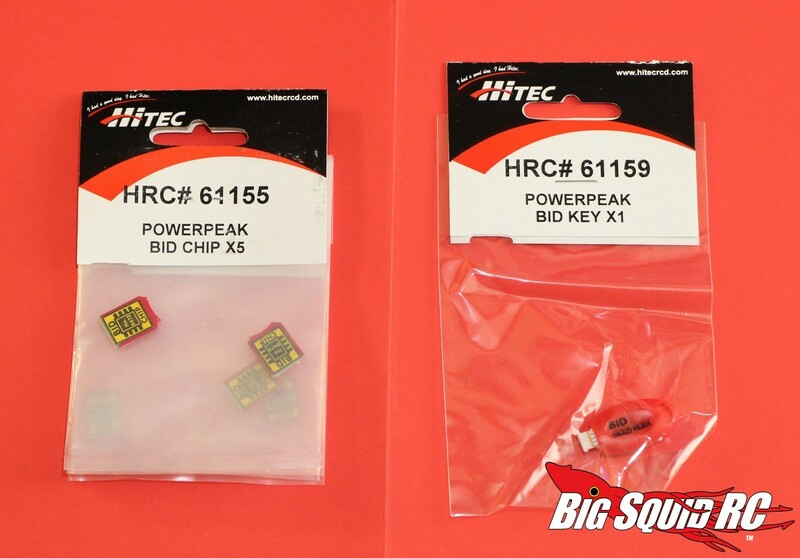 Primary Competition: Who does the Hitec compete against? Chargers like the Reedy 1216-C2, the Duratrax Onyx 245, the Dynamite Passport Duo 400W, and various others. What’s In The Box: You get the charger, an AC power cord, a DC power cord, the owners manual, 2 balance boards, 2 balance board cables, 2 charge wires with Deans style connectors, and 2 charge wires with XT60 connectors. 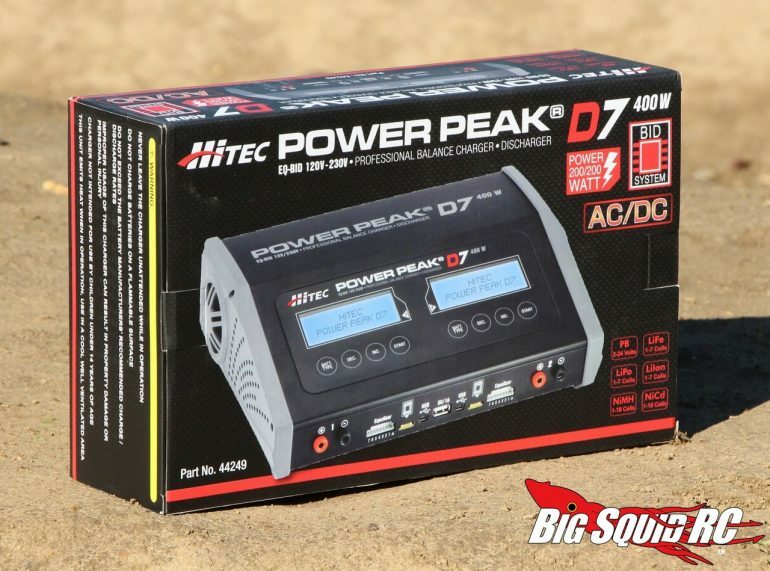 Build Quality: We were big fans of the build quality of the Power Peak D7. It had a nice beefy feel to it and utilizes a metal case with plastic end caps. All the wiring and soldering was well done. Testers: We passed the Hitec around to several of our Bash Crew members including Iron Mike, Tim Mohr, Robbie G, and Sam Da Noobie. And yes, I got in plenty of time with it as well. Set-up Notes: There wasn’t much to set up on the Hitec. We mostly used the stock connectors and ran it off of its internal AC power supply as well as DC power from a car battery. 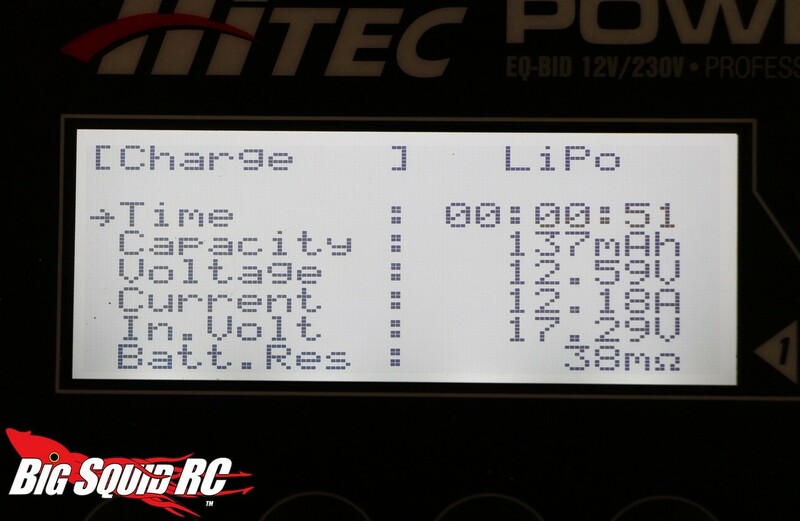 We charged up a LOT of different packs on the Hitec. 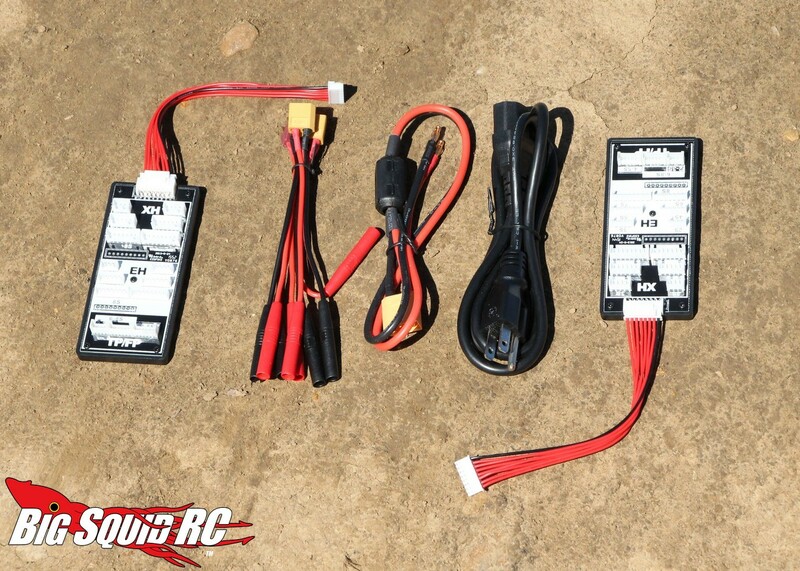 These packs included everything from small RTR 1/18th NiMH packs, to LiFe receiver packs, to big 3S MaxAmps LiPos, to giant 6S TrakPower LiPo batteries. Ease of Use: Our test for ease of use is simply seeing if every member of our bash crew could program, then charge, any pack in their pit bag without needing to refer to the owners manual. 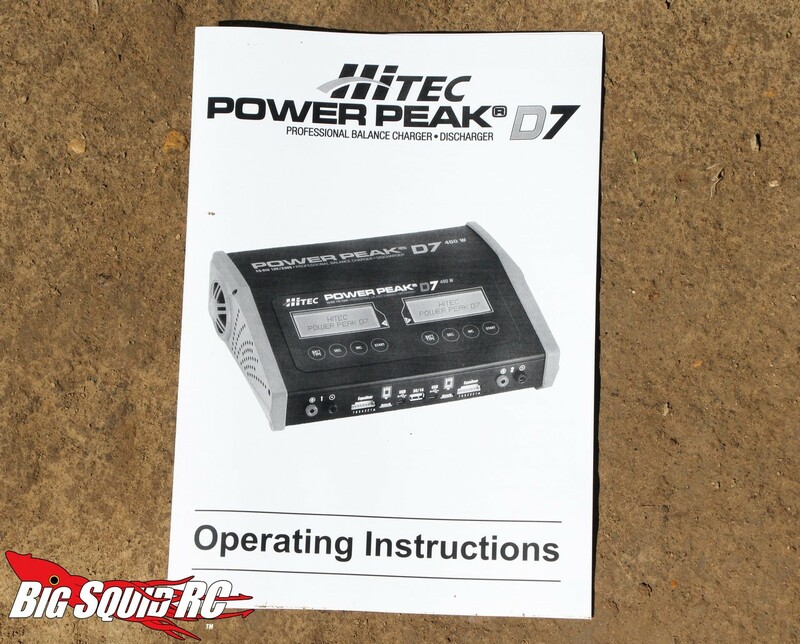 This test isn’t perfect, our test crew members have reviewed several Hitec chargers before, which certainly helped them navigate the menu on the Power Peak D7. However, at the end of the day, not one of our guys had to revert to the manual to charge a battery. Power: While not the most powerful charger on the market, the Hitec certainly packs one heck of a wallop. 20 amps of charge current is available on both channels, something that not a lot of other AC/DC chargers can do. We found that it had more power than we needed in nearly every application that we used it for. Our typical pack was a 2S 5400 where the Hitec could easily charge at 2C. On the Track: Like we always do with chargers, we charge up a bunch packs on our test unit, then charge them up on what we consider to be one of the best chargers on the market (in this case, an iCharger 308), then have our guys go out, drive, and see if they can tell when a pack was charged on which charger. This is done as a blind test, none of the drivers knew when a pack was charged on the Hitec, or when it was charged on the iCharger. 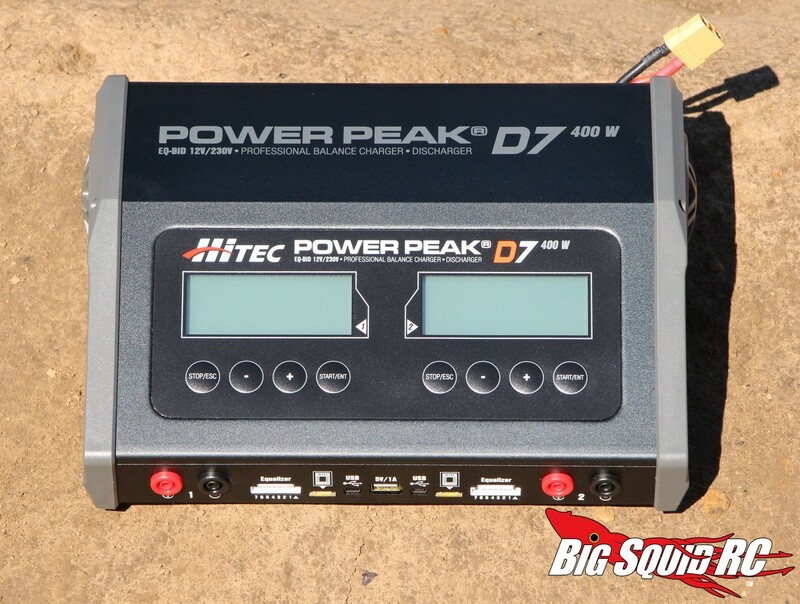 In the case of the Power Peak D7, our test drivers could find no difference in power output between the two chargers. 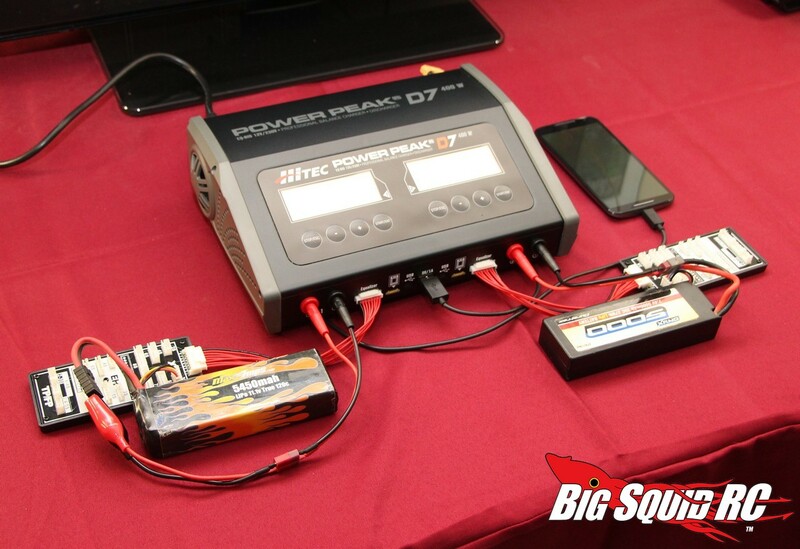 After driving various batteries charged by the Hitec, our test crew members felt the packs had tons of punch with plenty of voltage, exactly what you expect when buying a high-end charger. The fan on the Hitec is not loud, something that we really appreciated. A good old fashioned paper manual comes with the Power Peak D7 and it is a good one. While more experienced hobbyist probably won’t use it much, if you are a noobie, the manual is well written and easy to understand. The D7 has the option of using small chips for a Battery Identification System (BID). We received several chips with our review unit and found that they came in really handy. What do they do? The BID system helps make sure that every pack you have is properly charged. The BID system uses a chip to store all relevant data, including exact charge and discharge settings, to a specific pack. 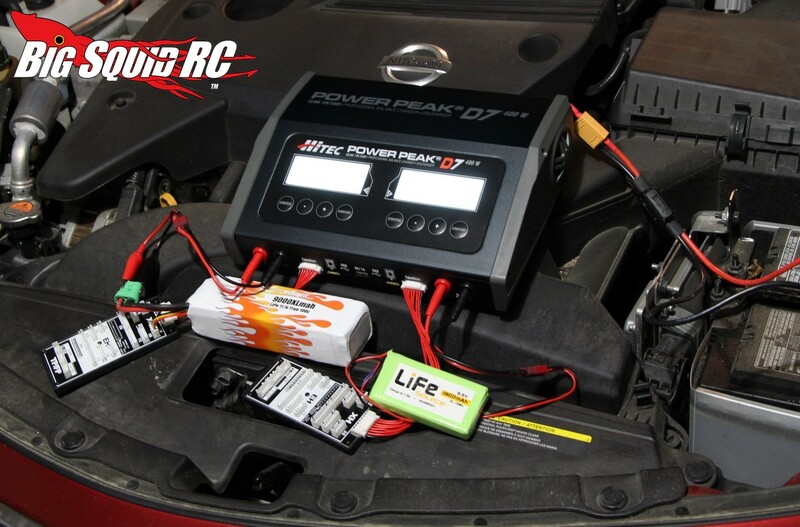 Ever accidentally started charging a LiFe pack as a LiPo? The BID system can help prevent that. 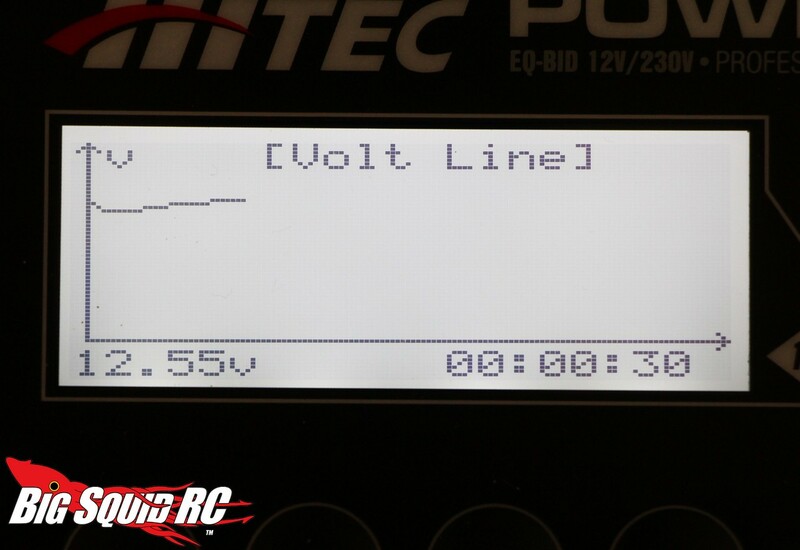 The end of charge alert on the Hitec is… pleasant. Not too loud, not too soft, right on point. 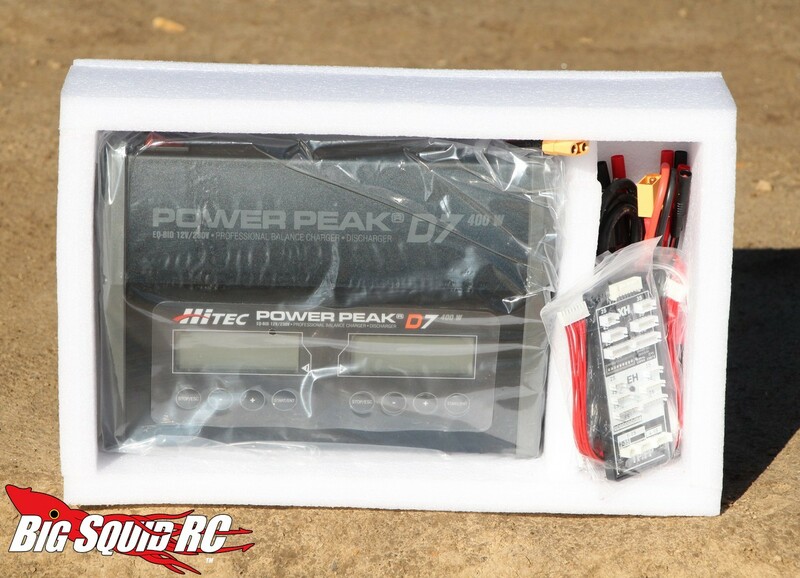 There is a lot of power under the hood of the Power Peak D7 and it has a big internal power supply. This results in a fairly large footprint. We didn’t have an issue with it in a basher setting as we had plenty of room under the hood of a car or on the bed of a pick-up truck, but if you race, it will certainly take up some space on your pit table. The D7 comes with one USB output and it’s on the front of the charger. We prefer a front mounted USB output, it is simply easier to use, and we used it constantly to keep our phones charged. Final Verdict: We consider the Hitec Power Peak D7 to be one of the best bashing oriented chargers that you can buy, and for several reasons. The Hitec has a lot of power, you can charge two batteries at a time with it, it can be used on AC or DC, it is easy to learn/use, and it provided an excellent quality of charge on our packs. 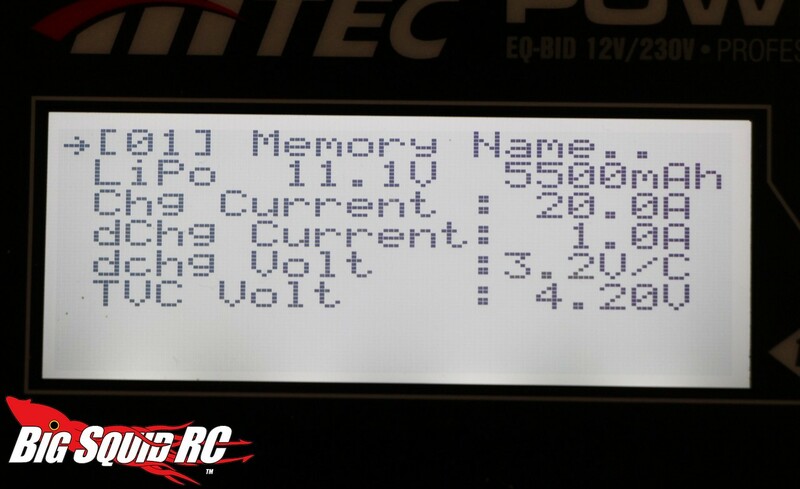 If you are in the market for a high powered AC/DC dual port charger, we can very highly recommend the Hitec to you.